Hi guys. Let’s get the introductions out the way so can get right to the exciting stuff. My name is Gavin, and for the past nine years I have been living in Tokyo working for Sony’s Worldwide Studios. 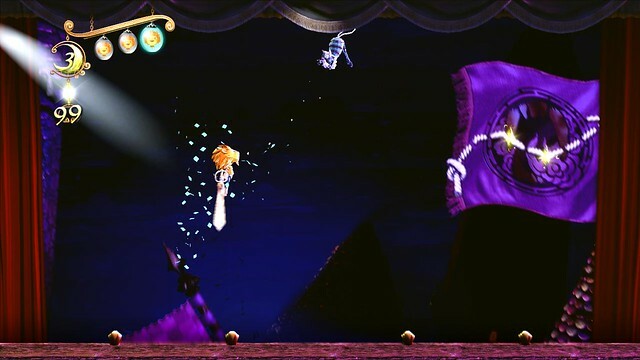 Recently, I and a small — but incredibly talented — group of game makers have been hard at work on a new PlayStation 3 game called Puppeteer. I’m excited to be able to talk directly to you guys, the heart of PlayStation, and give you the heads-up on the game first. On one dark, moonlit night, the star of the show, a young boy named Kutaro, is carried away by the maleficent Moon Bear King to a black castle, where the unlucky lad is transformed into a puppet. Kutaro then displeases the terrible tyrant who duly devours the boy’s wooden head and casts away his body. But the headless hero is not alone, for he discovers a very special pair of magic scissors, which will help him on his harrowing quest to find his head — and his way home. 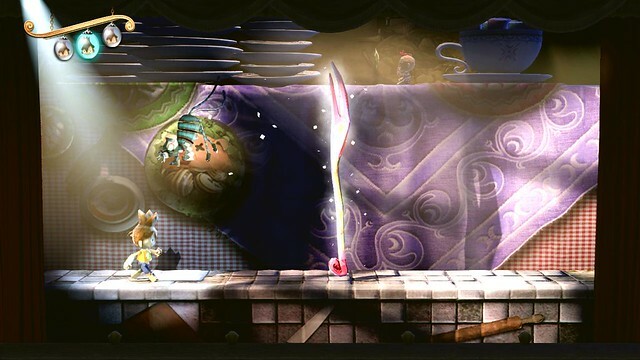 Unlike most games where you move through the world, the world of Puppeteer actually moves around you, with all the action taking place on the same stage. The sets are continually moving and changing, taking you on an adventure with surprises in every scene. It’s packed full of weird and wild situations that we think you’re going to love. I’m a big fan of old school platform gaming, which we feature in abundance here, but we’ve added a twist — Kutaro’s scissors give him the power to cut his way through this dynamic world. You’re going to have a blast slicing your way through Kutaro’s adventure, or taking out one of the game’s numerous bosses with a few deft cuts. This looks great Mr. Moore, It ‘s so nice to see that the whole games industry hasn’t turned to brutal hyper violence. Impressive. Had to watch the trailer a few times to see everything that was going on. Thanks Cisco, We can’t wait for you to play it! You guys actually think this game (at least as depicted in the trailer) is appropriate for children??! I found it creepy/disturbing to watch as an adult. Really not sure this is something that should be shown to young innocent developing minds, unless you’re trying to warp them. Wow the art style is just sheer madness, I love it. The lighting is amazing. A wonderful surprise from GamesCom. Clearly one of the games I look forward to playing in the near future. I love Sony and taking chances on new IPs. Not being an old-school gamer, I generally hate platformers but I make exceptions for really clever, well-executed & novel games. This looks likes it’s going to be pretty good. I look forward to more information. Great presentation @ Gamescon. Damn. I was hoping for a Ps Vita game from this studio. Seems like my kind of game too. 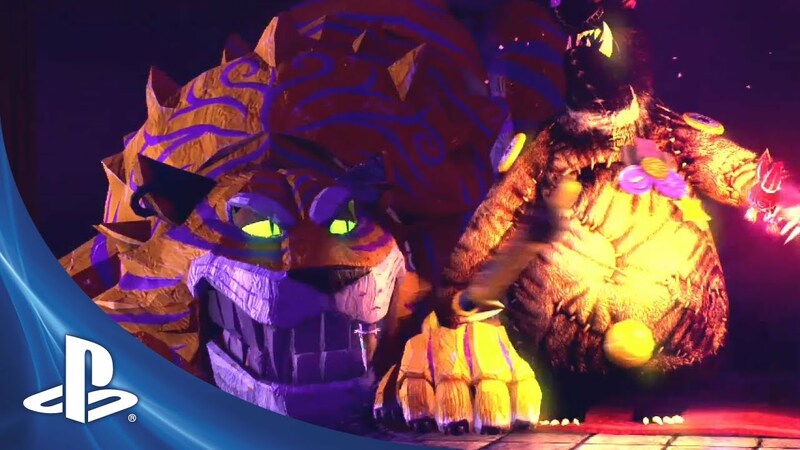 Is this a PlayStation Network game or a retail PS3 game? Hi Red, Puppeteer will be available on Blu-ray Disk at your favorite retailer! Not another dudebro shooter, and to top it off the game looks super fun. Count me in. WWWOOOOOWWWW… Seriously… This looks exceptional. I haven’t been this floored by a trailer in a very long time. Puppeteer, Rain, and Tear Away are my personal games of show. This was better than E3’s presentation. Good job, Sony. This looks pretty fun. I’ll be watching this. @Burmecian: Where in the article does it say this is aimed at kids? Also have you ever watched a Tim Burton kids movie? This reminds me of those when I saw it. Also when I was a kid there was movies that were kind of scary to watch. Secret of Nihm, Labyrinth, The Last Unicorn just to name a few that had those darker scarier themes. They sure didn’t warp my mind or my sisters. Makes me think this is actually aimed at older people. This game was definitely a surprise, it looks outstanding! That one character reminds me of Mr. Oogie Boogie. I love the artstyle of this… so this is a sidescroller, but with sets change out instead of the screen actually scrolling? Hi Kylote, Correct! This all takes place at a magical puppet theater where the stage, sets, and lighting keep dynamically changing! I’m kinda confused because this was shown after the PSN exclusive game Rain but is Peppeteer available on disc or only digital? The developer in the press conference said he made this game for his kid, and kids around the world, when he introduced it. Also I don’t think Tim Burton’s stuff is something that should be shown to children either. Between this and Rain, it looks like Japan has been stepping it up a notch! @Burmecian: Well I guess it’s a game you don’t have to worry about enjoying then. wow, just wow, looks absolutely amazing, more awesome PS3 exclusives abound!!!! Wow! You guys have created something that looks amazing! Make sure that audience cheers from beginning to end. This is definitely a MUST buy! I haven’t seen a side scroller this amazing in awhile! Day 1 purchase for sure. All I need to know is the release date and I will preorder!!!! Visually stunning art style! Can’t wait to try this game out. I don’t see how it’s an issue for kids… I’d go into a big spiel about it, but people are set in their ways. Keep treating kids like mindless dolts if you want to, but they’re have more potential than most allow them to have these days. Anyhoo… game looks amazing. I’m glad that it’s a retail title. This looks solid! Bring this to Vita as well. Seriously wow wow wow! I stopped the trailer so it wouldnt spoil the game.This was a nice surprise! Will buy ASAP! this looks amazing! Is this a full ps3 game or a PSN game? Either way, it looks very good. This looks like a ton of fun! I’m digging the resurgence of 2D side scrollers that is going on right now. This game looks way cool and I can’t wait to get my hands on it! Wait so we get something nice and unique like this that ISN’T a PSN game OR a PS move game?! From the trailer I was worried what it was going to be on. For a full game? this game looks creepy and intense! Kids will love it! Trust me. When you don’t have a matured mind as a grown up does, your imagination runs WILD! I used to play this pac man game on the dreamcast as a kid and it was scary and creepy! It was made my mind open up! It was so immersive. I hope this game does so well and opens up the imagination inside that little kid’s head. anyways Sony is really knocking is out of the park for the Vita. I’ll see what Black Friday holds in store. Right now it looks terrible! But with PS1 support at the end of the month and a slew of amazing new games coming up (Terraway looks like my kind of game) I’m changing my mind about it! this game would be better as a PSVITA game. WOW. This game is so amazing, exciting adventure. I am really Interested in playing puppeteer. As interested as I am, I don’t know if this is a $60 game. looks like lbpVita + trine. looks cool, but imma have to pass. This is utterly amazing! It has been some time since I saw something with this genuine magical feel and atmosphere, great idea to base the concept in a puppet theatre. I am sure it will be special, like almost seeing a spectacle in front of you as you play it. Also, the art direction and the care on crafting profundity, textures and volume are superb. It makes me happy that a lot of producers are brave enough for such experimentation and artistic improvement, and that PlayStation is also supporting it. Will this support ps move?? please say yes!! I would like to say that you are right. You are incredibly talented. This game looks awesome. It looks like just like the right amount of creepiness and charm just like Coraline or Nightmare Before Christmas. I was so amazed at what I was watching I watched it three more times to make sure my eyes weren’t fooling me. I congratulate you on making a game like this. Like Tearaway it looks like loads of fun and the different heads things looks interesting. May I assume that each head gives you a different ability? If so that sounds exactly like that game Dynamite Headdy which if i remember was also a game about a puppet I think. Anyway good luck with this game. If it plays as goods as it looks you have a customer for sure the first day. Also can I also assume that the creatures following you have some abilities as well. Are they your conscious like Jimmy Cricket? This game looks very very interesting and one I will keep an eye out for. I had to watch the trailer a couple times, as others have mentioned, just to see the game in action. Since this is a full retail release, I do want a nice full single player game. Keep up the great work, this game looks awesome. For the love of all that is holy, will there be a Vita version ?